Now cold weather is in BC, colder than we’ve seen it in the past, many parents are wondering how to keep their children both safe and warm in the car. While the winter brings with it the promise of Christmas, it also poses the question of how best to keep our little ones warm without compromising their safety. Traditionally babies and young children would be bundled up into puffy jackets and snowsuits before being strapped in their car seats. According to Transport Canada website which insists that this practice is unsafe. Bulky jackets and blankets that come between the child's body and the seat, straps, buckles or harness, affect how well the car seat can function in the event of a sudden stop or collision. Bulky snowsuits can affect the harness with respect to additional compressibility. In addition, many snowsuits are made of very slippery material. This can affect the harness system should the chest clip of the restraint not be used properly. When using bulky winter clothing ensure that the harness system is tight, compressing the material to ensure a snug fit. 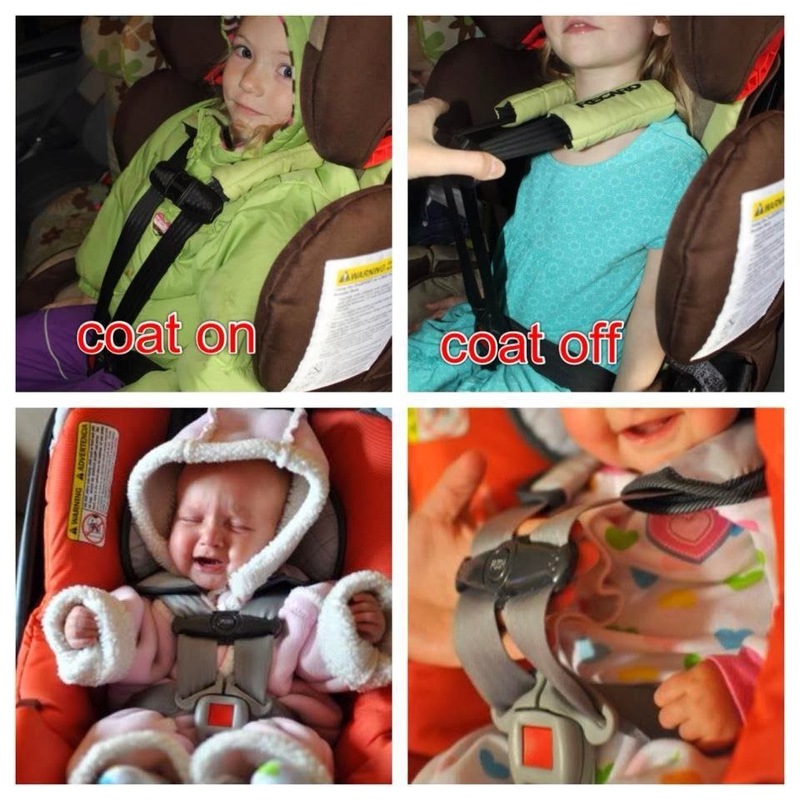 Babies and young children wearing puffy jackets and snowsuits require the car seat straps have to be adjusted (lengthened) to make more room for the extra material, and this means that the straps are no longer the right length to properly hold the child tightly in place. In the event of impact, the jacket will compress and suddenly the straps will be too loose, which can allow the child to either slip out of the seat or at the very least will rock the child much harder than if the straps were tighter. Experts agree that you should always avoid putting a jacket on your child in their car seat. But then this creates new issues, because how else can you keep your child protected from the harsh cold? - Dress you child in their normal indoor clothing and then add a fleece coat or hoodie. Fleece is thin enough to not affect the safety of the seat but it keeps them relatively warm. Then after strapping them in, you can add more layers of blankets over them. - For older children you can walk, you have them walk to the car with their jacket and then once they are in the car, have them remove the jacket, get strapped in and then wear the jacket backwards over the buckled straps. - For infant car seats you can use car seat covers, shown in the photo above. This is the safest option they have. The reality is that it can be inconvenient to follow these rules. Especially with younger children, it can get tedious to keep removing and then taking of their jacket when putting them in or taking them out of the car, but ultimately we cannot place a price on their safety and our peace of mind.